I often get asked about the quickest way to accumulate miles and points for great vacations. Most people think you have to be a big spender or a hot-shot consultant to be able to rack up the amount of miles needed to get to Asia or Europe. I'm here to dispel this vicious myth. The fastest way to earn frequent flyer miles or hotel points is through credit card sign up bonuses. This is a great strategy and the miles (sometimes upwards of 600,000 miles/year!) add up very quickly. However, this method does come with caveats which will be discussed in future posts. Let's pump the brakes and first discuss which travel credit card is the most valuable for everyday spenders like you or I. The Starwood Hotel Group portfolio includes a wide range of hotels, from "basic" Sheratons all the way up to the trendy "W" hotel group as well as the ultra-luxury St. Regis properties. Starwood points (hereto referred to as "Starpoints") really can put you in some impressive locales. Using these Starpoints, Ms. CCT and I stayed at the Westin Moana Surfrider in Honolulu as well as the Sheraton Commander near Harvard Square in Boston. We had plenty of points left over to shack up at the Westin Times Square in New York and the Westin Chicago on our trips. We could never afford the Westin Times Square on our own The retail rate was $550/night(!!) when we booked our free nights around Christmas time, so we were insanely happy that we could use Starpoints to book our room. 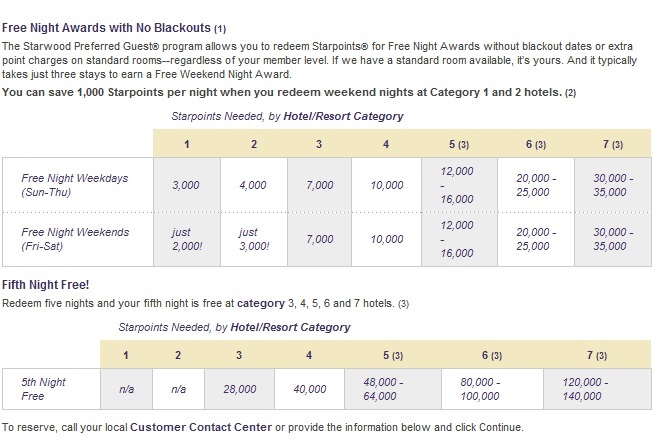 One of the best things about Starpoints is the ability to stretch their value beyond standard redemptions. 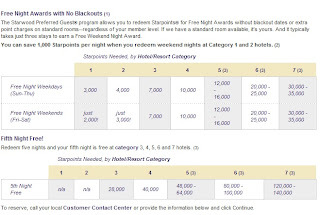 Most people don't know that when booking a four night award stay, Starwood will give you the fifth night for free! Check out the chart above and see for yourself. 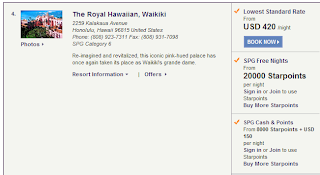 Staying at the Moana Surfrider usually costs 12,000 Starpoints for one night. Four nights would be 48,000. However, with the 5th Night Free option, the "cost" of each award night is now only 9,600 points, saving you 20% instantly! Another good value is the Cash n' Points option. 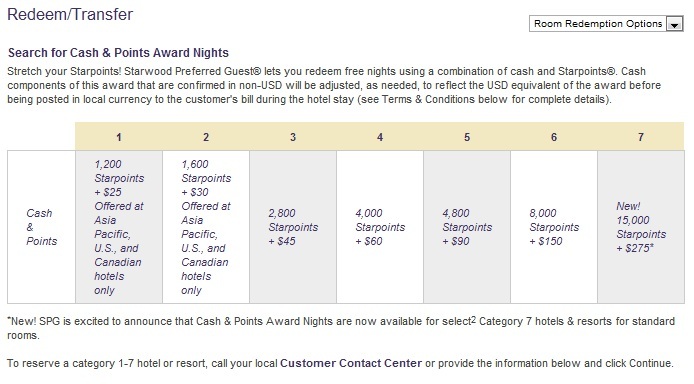 As you can see from the chart below, instead of a normal points redemption, you will pay a small amount of both Starpoints and cash instead. This method allows you to stretch your Starpoints further and get you into higher end properties at a fraction of the price. 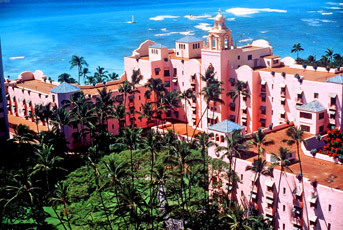 To show you a real life example, I pulled up dates in late November for the prestigious Royal Hawaiian Hotel in Waikiki. The normal rate is $420/night, certainly more than anyone I know is willing to spend. However, with Cash n' Points, you would only use 8,000 Starpoints + $150/night to stay there. An ultra-luxurious property for $150 is certainly a stunning value. 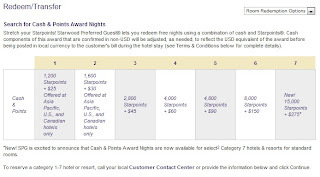 Look At the Value Cash N' Points Brings To Your Starpoints! 3. Points can be transferred to Frequent Flyer Programs...with a bonus! A sneaky underrated attribute of Starpoints is their versatility. 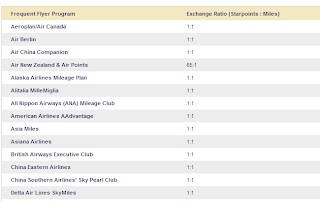 Starpoints can be transferred to many popular Frequent Flyer Programs such as American, US Airways, Delta, and British Airways. The best part? 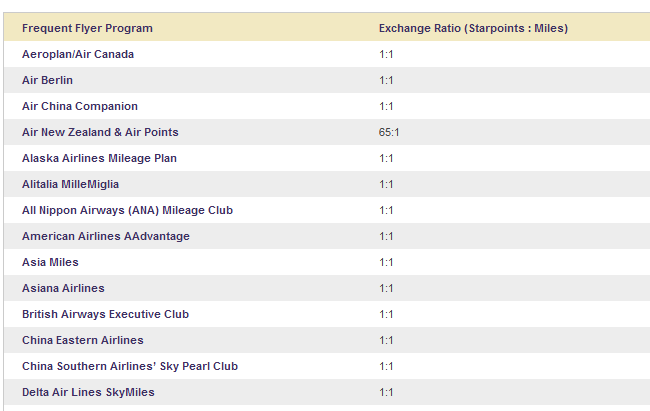 If you transfer 20,000 Starpoints or more in one transaction, Starwood will ADD 5,000 miles to the transfer. Essentially, you are earning 1.25 frequent flyer miles for every $1 you spend. That's like a 25% bonus! I have transferred Starpoints when I badly needed American Airlines miles for a trip, and the 5,000 extra miles were a huge help. Don't dare overlook this option. The only drawback? Transfers can take up to two weeks. If you need the miles ASAP, you're out of luck. I don't usually advocate holding a credit card with an annual fee, but the Starwood American Express comes with a relatively modest $65 annual fee. Better yet, this fee is waived for the first year of card ownership. When compared to other hotel/airline cards that come with fees $95 and up, this is quite palatable. I will discuss this in future posts, but having elite status at a hotel can be the difference between an ordinary, boring stay and something far more spectacular. 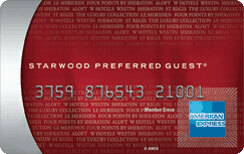 This card will automatically credit your Starwood account with 2 stays/5 nights towards qualifying for Gold Elite Status. Gold Elite Status at Starwood properties comes with upgraded rooms, free internet, and bonus points after every stay. The intro picture of this very blog was shot from the "Deluxe Ocean View Room" that I had at the Moana Surfrider, which wouldn't have been given to me had I not been a Gold Elite with Starwood. Every little bit helps in these cases! American Express is currently offering a 30,000 Starpoint signup bonus provided you spend $5,000 within the first 6 months of card membership. This isn't an unreasonable amount of monthly spending, and once you hit the threshold, you will have plenty of Starpoints to plan a great vacation. Questions about this card or the post in general? Drop me an email, leave a comment, or tweet me. I'm here to help. This card is a great introduction to your miles and points adventures. Benefits of Aramor Payment Processing Solutions high risk merchants credit card processing ... Accounts for all industries. We offer merchant accounts for low, medium, and high risk businesses. They are able to make deposits to their children's account while they are away from home. Students should be careful with their credit card receipts to avoid identity thief. As you comprehend this product in the wake of finishing its establishment, we recommend you to call us at our Support focus by dialing QuickBooks Payroll Customer Service 1888-567-1159. You can associate with our support delegate. We guarantee that our expert gives you best arrangement in regards to your inquiries. We offer Professional Help and Support for QuickBooks. Since, QuickBooks is a propel programming with numerous details required with it. Some of the time it is hard for clients to deal with the specialized issues that emerge with it and that is the reason we have a group of QuickBooks Experts at Quickbooks Technical Support Phone Number 1800-291-2485 keeping in mind the end goal to determine all your bookkeeping inquiries and issues.